This is a picture of the Coburg Olympic Pool diving board I took last summer. It is suddenly, this week, no longer there. Without any warning, an important piece of local history has been reduced to rubble. 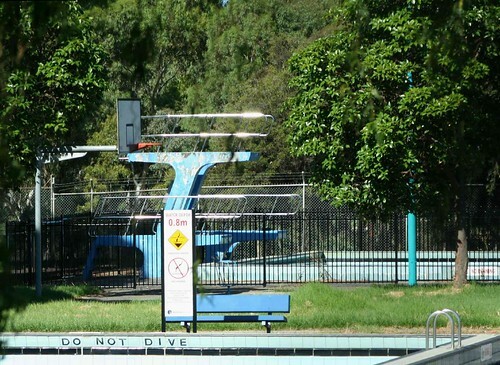 This diving board had been closed since 2003 as the the Moreland Council stated that it did not comply with FINA safety regulations (international governing body for swimming. The rungs on the high board had been removed, presumably so that until the pool closed in 2006, there was no danger of misuse. 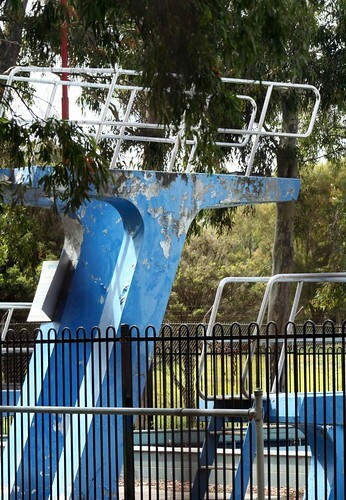 There has been talk of the diving boards being replaced with something that met current safety standards, but the Friends of Coburg Olympic Pool have believed that the diving boards have significant heritage value. The diving boards could have been left as they were, in their shapely glory, pending a heritage survey, and the black diving pool fence extended to allow for another, useable diving platform to be installed at the same time. It didn't have to be an either/or proposition. Now we will no longer see the glint of steel amongst the trees on a hot day. Even if the towers were to be reconstructed in a similar style, something of their essence, what made them unique in the first place will still be lost forever. More pictures of the diving board here. If anyone has any pictures of the diving board (old or recent), we'd love to take a copy and record this part of the pool's history for the future. Please email me if you can help out in this way. It's still going to be great at the pool this summer, and we're going to focus on the positives, but as I said before it didn't have to be this way. How could Jenny Merkus have allowed the demolition of these wonderful diving stands?